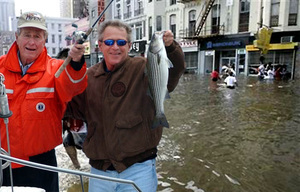 Bush's long vacation may have distracted him from his duty as Protector-in-Chief of the American people. But he apparently hasn't forgotten about his responsibilities to America's schoolchildren under No Child Left Behind. "Schools welcoming the displaced students must not only provide classrooms, teachers and textbooks, but under the terms of President Bush's education law must also almost immediately begin to raise their scholastic achievement unless some provisions of that law are waived." The last I heard, Secretary of Education Margaret Spellings wasn't considering waiving any of NCLB's stringent requirements.